Learn to prepare a variety of cheese hors d’oeuvres and small bites for your next get together. 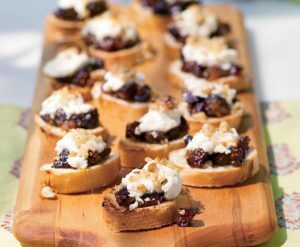 Among the tasty tidbits you will learn to make are blue cheese, fig and caramelized onions crostini in a balsamic reduction and spinach and artichoke stuffed mushrooms with cheese. Join us for a lovely evening constructing hors d’oeuvres and eating all of them in class. Please bring $20 for ingredients.